Jiang Tiefeng was born in Ningbo, Zhejiiang Province, China in 1938. Even as a child he displayed a great love and talent for painting and drawing, and early on he knew the course his life would take. Jiang worked under the famous Chinese artist Huang Yongyu. 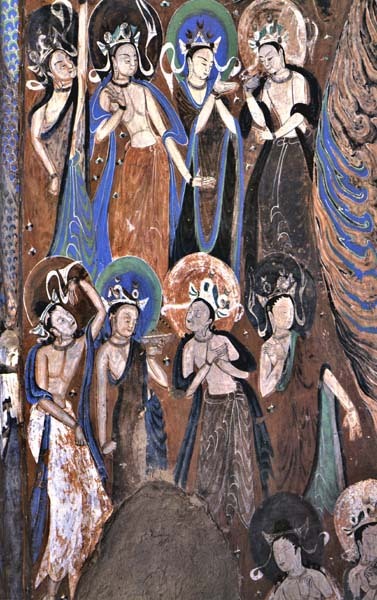 Jiang learned about the legendary DunHuang Caves, which to this day have a series of fantastical paintings created during 300 to 1000 AD. These ancient images of warriors, kings and people from all walks of life, became the inspiration for Jiang’s signature style. Due to the discouraging any individual artistic expression by China’s Communist Regime , Jiang had to perfect his craft in secrecy. Upon moving to the United States in 1983 he was able to paint without fear of political persecution. Today, Jiang continues to create Sublime paintings and sculptures, his deep love of the earth along with his life experiences earned him a legacy as a True Master that will be collected for decades to come! In 1959, in a highly competitive exam he won admission to the prestigious Central Academy of Fine Arts in Beijing. From 1962-64 he studied with the famous Chinese artist Huang Yong-yu, who first exposed him to the paintings from the Dunguang caves. In 1964 he earned his Bachelor of Arts degree. This was the last class to graduate before the Cultural Revolution. Jiang also learned about traditional Chinese art, an influence which would remain with him. Jiang and a small number of other artists volunteered to go down to the Yunnan province on the Vietnamese border. It is lush and tropical, filled with exotic flora and fauna, and is home to more than 20 different minority peoples. Jiang's talent was so obvious that from 1966-73 the Chinese Government assigned him to produce "Socialist Realism" propaganda posters and sculptures during the Cultural Revolution including the famous large red-faced poster of Chairman Mao. At night he worked in his small room to create his own style. 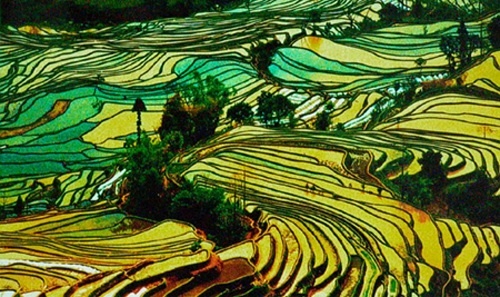 The natural beauty of the Yunnan province inspired him. With two other artists, He Neng and Liu Shaohui, Jiang secretly formed the nucleus of what is now known as the "Yunnan School" . Jiang's work quickly gained prominence and even the repressive authorities had to concede his talent. He became one of the most well-known illustrators of children's books in China. In 1974 he illustrated "Two Little Peacocks." In 1976 he designed the animated cartoon of the same book. 1978-1983, Jiang taught at the Yunnan Art Academy. In 1979, the Chinese Government commissioned him to paint a mural representing Yunnan Province for the Great Hall of the People in Beijing. The project took seven months and used six full panels of silk. 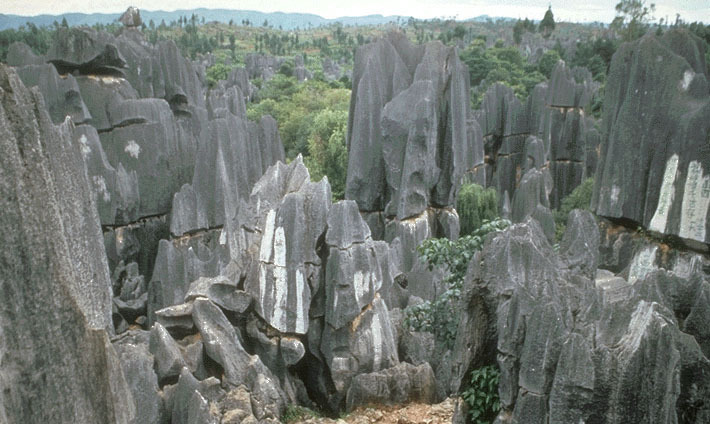 This was the "Stone Forest" mural, one of Jiang's finest works. Jiang himself says: "This mural was the first time I had ever let my own true style show publicly. The color, energy, and fantasy of my painting was not appreciated by the government during Mao's Cultural Revolution. While I was painting "Stone Forest" an official came by and said I shouldn't do it that way. I said "Okay" as if I would change it. But I didn't change a thing. Later he came back and said "Oh, that's much better." He didn't know what he was talking about. He was just comforted to think that he, a government official, had control over this strange, dangerous art." In 1907 European explorers rediscovered the Buddhist caves on the Ancient Silk Road that led from China through Persia and finally to the West. At Dunghuang, the last caravan stop with a plentiful amount of water and supplies before travelers from China ventured into the perilous Takla Makan desert, the explorers discovered a group of more than 400 caves with paintings of extraordinary quality which had been very well preserved by the dry desert climate. These paintings had been created over a period of 700 years, from roughly 300 to 1000 AD. They were commissioned as devotional acts by pious Buddhists: warriors, princes, kings, merchants, peoples from all walks of life--created in the same spirit as were the Gothic cathedrals of Europe. But by the 12th century wars and other geopolitical forces caused the abandonment of the caves, and they lay forgotten until their rediscovery by the Europeans in the 20th century. 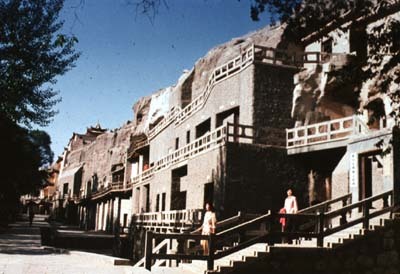 In 1942, a well-known and respected traditional Chinese artist Zhang Daqian led an expedition to the caves. He spent 2 1/2 years studying and copying the astounding paintings there. When his work became available to other artists and scholars it caused great excitement, for just as African and Iberian art and the cave paintings of Lascaux had inspired and liberated Picasso, so the revelation of the free flowing qualities of line and form and the rich mythic traditions of the Dunguang cave paintings inspired and liberated the young Chinese artists. Jiang was particularly moved by the colors, the linear quality, and the mythic stories of the cave painting--and we see this in his work. But above all, the cave art was an indigenous Chinese tradition, a tradition that gave the artists similar freedoms to those won by the artists in the west, but at the same time it was a tradition that the artists could freely pursue without fear of being accused of being Anti-Chinese. The traditional mythic themes and images, and the rhythmic flow of the cave art have found their way over and over again into paintings of Jiang and the other "Yunnan School" artists. 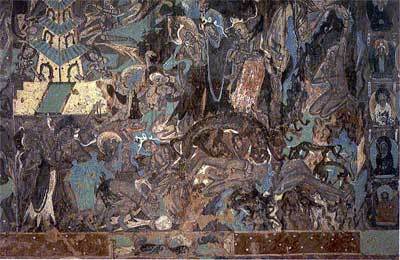 But the greatest Chinese influence was the art created in the Dunguang caves in central China. The influence of the Dunguang imagery and style combined with European Cubist influences, such as the use of transparent washes of colors to allow for a multileveled view of reality, characterize Jiang's work to this day. Jiang would also incorporate many of these traditional Chinese folkloric images into his art. Jiang's colors are of unsurpassed richness. 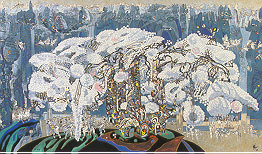 A colorist, Jiang's intention was to reverse the trend of the stale Chinese tradition of painting in gray, black, and white. Jiang says: "Chinese art had reached a sick level due to its lack of color." Jiang's credo is: "Long live the Line!" He is a genius at using line to give the illusion of depth to a flat two-dimensional surface--almost like an x-ray. Jiang's paintings are like cubism: by using superb drawing he creates transparency, and thus he reveals more than one level of reality in each painting. Jiang is a storyteller. His paintings are steeped in Buddhist and Chinese mythology. Each figure has a symbolic meaning. The paintings have so much complexity and visual fascination that the viewer is constantly seeing something new. Jiang says "For every picture there is a story, and for every story there is a picture." Jiang's vision has continued to grow and expand. Probably because of his personal experience in two cultures he has increasingly seen the world as a single system, as a meeting place of diverse forces. This is reflected in the number of environmental and ecologic themes which have recently begun appearing in his work, notably in such pieces as "Nature Suite," "Genesis," "Lovers Trees," and "My World." For Jiang, success followed success. In 1979 he illustrated "The Secret of Jinchun Tree," which won the first prize as the best illustrated book out of Jiangsu Province. His painting "The Legend of the Water Sprinkling Festival of the Dai" was featured in the documentary film "Yunnan Scene." In 1980 the illustrated books "Little Red Riding Hood"; "The Ugly Duckling"; and "A Shi Ma" were published. For "A Shi Ma" Jiang was awarded Second Place in an international United Nations competition of illustrated books. In 1981, Jiang's work was featured in the "10 Artists From Yunnan" show in Beijing, and then, in 1982, was prominently featured at a show in Hong Kong, which also featured the Yunnan artists as well as some of their followers. As early as 1981 the Chinese Government had returned to its repressive policies. Government officials publicly stated that they feared China was losing its "socialist morality" and becoming "morally polluted." Art officials favored a return to Socialist Realism painting and they expressed their displeasure by refusing to select paintings by Jiang, Liu Shaohai, or He Neng for the permanent collection of the National Art Gallery. Jiang was the prime target of their wrath--his paintings were excluded from television coverage and a seminar was even officially organized to criticize his work. His work was criticized as "...too daring and audacious...a nightmare." Jiang did have defenders. Liu Shaohai said that he would be glad to have nightmares every night if he could paint like that. The President of the Central Academy of Art and Design, Zhang Ding, wrote an article praising Jiang's work but withdrew it on the eve of its publication at his wife's urging, who remembered how Zhang Ding had been beaten and publicly humiliated during the Cultural Revolution. Even so, Zhang Ding did on a number of occasions speak out and express his admiration for Jiang and some of the other young artists. All of this was making life increasingly difficult for Jiang. In 1982 a National Geographic reporter who was doing a story on China saw Jiang's paintings, and brought some back to the U.S. A friend of the reporter brought them to the Fingerhut Gallery in Minneapolis, where Jiang's work met with great success. In 1983, Jiang came to the United States as part of a cultural exchange program with the University of Southern California, where he became a visiting Professor of Art. Under the sponsorship of Allan Fingerhut, Jiang moved to Minnesota with his wife Zhaolin. For Jiang, success in America quickly followed. His rich, strong color, and exotic but intimate imagery struck an immediate response with the American public. 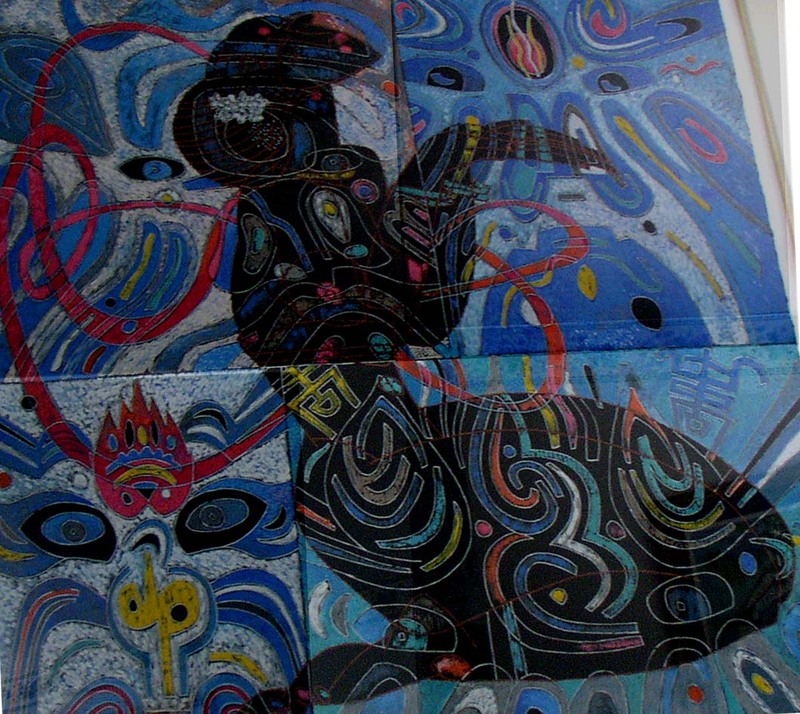 Jiang's talent and uniqueness quickly brought his work to the attention of critics and museum curators nationwide, and this resulted in many public exhibitions. 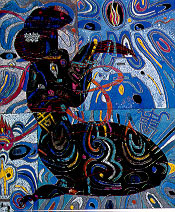 In 1984, Jiang had an exhibition at the University of Southern California Gallery; in 1985 at the New England Center of Contemporary Art in Connecticut; in 1986 at the Portland Museum in Virginia; in 1987 at the Springfield Art Center in Ohio; in 1988 at the Connecticut College Art Gallery; in 1989 at the Museum at Northwestern University in Massachusetts; and in 1990-91 at the Everson Museum in New York; the Springfield Art Museum in Ohio; the Michelson Reeves Museum in Texas; the Valdosta Museum at Valdosta State University in Georgia; the Art & Cultural Center in Florida; and the Olin Fine Art Center in Pennsylvania. During this period Jiang also had 52 one-man gallery shows in cities all over the country. Modern Western influences played a part in the formation of the Yunnan school, but traditional Chinese art--such as the sculpture from the Han Dynasty (221 B.C.-220 A.D.) played by far the most important role. This method, invented by the ancient zen artists more than 1500 years ago, is the precursor of abstract expressionism. By flicking the paint of the end of the brush the artists could create a totally energized surface. 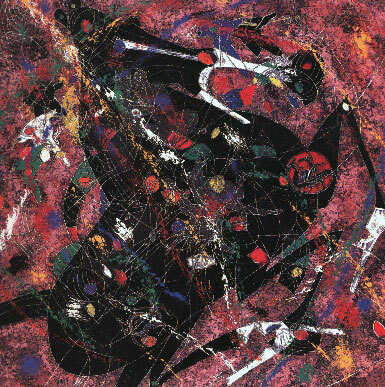 This is precisely what Jackson Pollock rediscovered in the 1940s and 50s. But the Chinese had always used this technique, and Jiang uses it masterfully. Hani Terrace, on the banks of Honghe River in Southwest China's Yunnan Province, is an ecological wonder spreads out over millions of acres.